TESCO IRELAND DREW down nearly €3 million from the government’s energy fund to upgrade its heating and lighting systems. 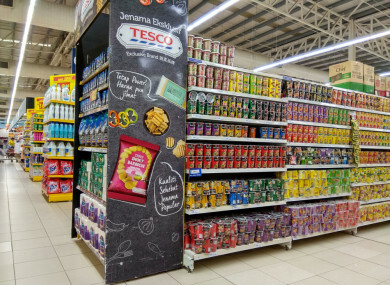 The supermarket chain had a multi-store LED lighting upgrade across seven Tesco stores nationwide, which was funded by the Ireland Energy Efficiency National Fund (IEENF). IEENF was established to provide loan financing to both private and public organisations in order to support the delivery of energy-efficiency improvement programmes. A document seen by TheJournal.ie states that the lighting upgrade to the Tesco stores unlocked 60% energy savings. It adds that the “fully funded services contract” resulted in “immediate operational savings and equipment upgrade for Tesco”. When asked why is the supermarket chain drew down the government funds, Tesco told TheJournal.ie that it wanted to become a low carbon retailer. “Tesco Ireland has been working in partnership with SEAI for over 10 years to reduce its energy consumption and the carbon emissions from our stores,” said a statement from the supermarket chain. The retailer added that it in 2014, the Sustainable Energy Authority of Ireland (SEAI) asked Tesco Ireland to work with the then newly established government’s energy efficiency fund “to help kick start the programme”. Tesco accelerated its roadmap to become a low carbon retailer and worked with the SEAI to access the fund. This joint government-private fund allows energy projects to proceed, with the savings generated used to repay the Fund, which generates a margin. The fund has been repaid in total by Tesco Ireland. Department of Communications, Climate Action and Environment said in a statement that energy efficiency “is critical to reducing Ireland’s emissions, which is crucial if Ireland is to become a leader in climate change”. It said the IEEF was set up to provide specialist financial expertise and loan finance to promote investment in large scale energy efficiency projects in the private and public sectors. The statement said loans to public sector bodies and private sector companies are given “to fund energy efficiency projects which would in most cases not otherwise happen”. The department said the emissions reductions benefit the climate and environment, while helping businesses reduce their costs and improve their resilience and competitiveness. The fund expects to make a 8% return on investment based on the interest charges on the borrowing, said the department. The IEEF is a commercial company, regulated by the Central Bank of Ireland. It is mostly funded by private investors but the government is a minority shareholder. The Controller and Auditor General has previously noted potential risks with the department adding that there are concerns the department does not have control over the investment decisions and that fund may incur significant professional services costs. Total investment in the IEEF amounted to €13.7 million comprising of the €2.9 million drawn down between May 2014 and October 2015 from Tesco and €10.8 million in May 2018 for the Mater Hospital. Email “Tesco drew down €3m from government fund to 'go green' with its lighting systems”. Feedback on “Tesco drew down €3m from government fund to 'go green' with its lighting systems”.